Twitter's Geolocation API Appears To Be Live. But Most Of You Are Lost. I noticed something interesting tonight. 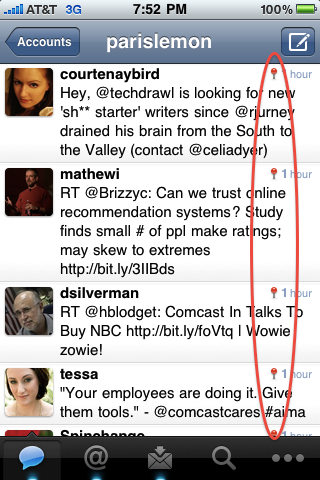 In the new build of Tweetie 2 (not out yet), a bunch of little red location markers started appearing next to tweets in my stream. Knowing that this new version was built using Twitter’s new Geolocation APIs, I inquired if this mean they had been turned on. Sure enough, they have, developer Loren Brichter just confirmed after talking to Twitter . Brichter is aware of the issue and has already resolved it, and has resubmitted Tweetie 2 to the App Store for approval. Since no one officially has Tweetie 2 yet, this probably doesn’t affect you at all. But you have to wonder if other Twitter app developers were confused by this as well. If so, we could see a lot of apps with some wonky geolocation data. Twitter hasn’t yet responded to my request for more information. It’s not clear if they meant to turn this on tonight. We do know that they had originally planned to launch it last week at the Twitter Conference in LA, but it wasn’t quite ready yet. Earlier today, Twitter announced the new Lists feature, which will also feature an API. And of course, everyone is waiting for the Retweet API as well. 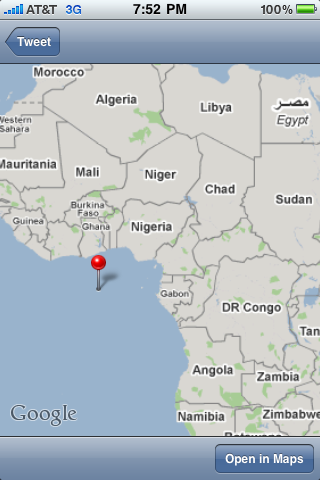 Update: As our apparently geography major readers have informed me, the area just off the coast of Ghana is lat/long 0,0. 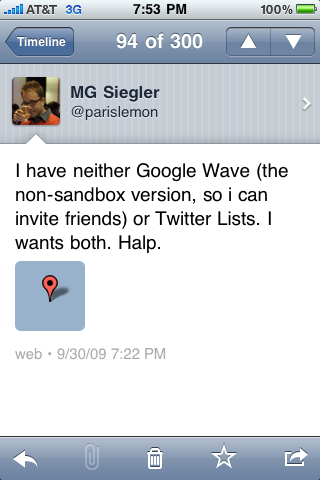 This makes sense — there is no location data attached to these tweets, so apparently they default to 0,0.